Elements Applied: Green parts of the plant, namely leaves and stem, are applied in herbal medicine. Active Components: Horsetail is characterized by high content of silicates and silicic acid, which contain nearly 2-3 percent of pure silicon. The herb contains 15 kinds of bioflavonoids, as well as manganese, aluminum and potassium. Bioflavonoids are considered responsible for the diuretic effect the herb produces, while due to silicon concentration the plant is used to treat arthritis and make connective tissue stronger. According to several scientists, silicon is an essential element which takes part in cartilage and bone formation. 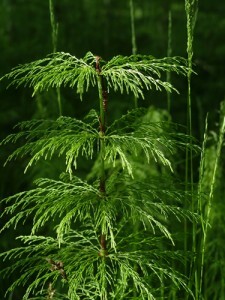 Consequently, horsetail can be applied as part of treatment for osteoporosis. Horsetail has been occasionally applied as part of strengthening therapy for feeble nails. Other: Aconitic acid, thiaminase, dimethylsulphone, and saponin equisitonin. History: After Roman medical specialist Galen proved horsetail’s healing capacity, the herb has been applied by several nations as a conventional medicine for tuberculosis, bleeding ulcers, arthritis, bladder and kidney conditions. Moreover, the herb was applied externally to wounds and sores, as it helped reduce bleeding and provide faster healing. Horsetail was also applied for cleaning pots and shaving wooden things, due to which fact it was called ‘shave grass’ and ‘scouring rush’. Used For: The herb is known to induce urination, perspiration, produce a healing effect, and act as astringent. The list of conditions in which horsetail is applied includes: water retention, rheumatic arthritis, osteoporosis, osteoarthritis, and feeble nails. Horsetail is known for its unique ability to get dissolved gold from water, and the quantity of this metal it manages to take from water is four ounces for a ton of fresh flowers. Rheumatic arthritis is said to be relieved using inconsiderable quantities of gold, for which reason horsetail was applied for arthritis in Chinese medicine. Horsetail is known to include a mild diuretic component, which takes responsibility for its application as urinary tract stimulating remedy. Horsetail is best for water retention. Horsetail’s astringent properties are especially beneficial for urinary and genital organs, curing sores and stopping hemorrhage due to rich content of silicon. The remedy produces a mild diuretic effect. It is additionally applied for treating enuresis in children. Horsetail is particularly effective in treating prostate gland swellings and inflammations. Its healing capacity is utilized for topical purposes. Occasionally, the remedy was found effective in curing chilblains and relieving rheumatic pains. Commonly mixed with: To relieve prostate diseases horsetail is commonly mixed with Hydrangea. Chinese homoeopathists prescribe Horsetail for the conditions like conjunctivitis and inflamed eyes. Due to its high trace mineral content the herb is applied for stimulating the organism. Not recommended for prolonged application. Additional Info: Horsetail can be found elsewhere in temperate climate areas, including Europe, North America and Asia. Two kinds of stems are characteristic of Horsetail alone. The first type of the stem appears at the beginning of spring and is highly similar to asparagus, being brown-colored only, and having cones which bear spores. The ripe type of stem grows in summer, features numerous branches and is similar to a tail in its appearance. Preparation and Intake: If used as tea Horsetail is applied in a dose of 1-4 grams a day. For an infusion take two teaspoons of dry plant extract and fill it up with 250 ml of boiling water. Steep it for 15 to 20 minutes. The result is employed thrice a day. As a bath additive the herb is applied for relieving chilblains and rheumatic pains. Take 100 grams (three and a half ounces) of the herb extract, infuse on warm water for 60 minutes. Pour it to your bath water. In form of tincture the herb is applied in a quantity of 2-6 ml thrice a day. Safety: The remedy is contraindicated in case of weakness, pregnancy, increased urination or body dryness. Horsetail is stated to be safe when used in suggested quantities by grown-ups except pregnant women. You should only choose the herb carefully, as its various species are different in their content; Equisetum palustre is known to include toxic alkaloids, which make it a famously applied livestock poison. There is still no concrete FDA rating with regard to Horsetail application. According to Canadian Health Protection Branch, Horsetail components of various medicines should be supplied by correspondent documents which state they are safe for use and don’t include thiaminase enzyme, which is responsible for decreasing vitamin B thiamin in the organism. Due to the fact that this enzyme can be reduced when exposed to alkaline environment, temperature or alcohol, liquid extract, medications, and tinctures are commonly prepared at 100 C temperature, to provide the safest remedy available. These ones are the most reliable for application. Horsetail contains high doses of selenium. Selenium overdose may result in fetus defects. The damps which are located on the enriched soils are the place where horsetail, especially rich in selenium, grows. Consequently, the herb should not be used during pregnancy. Equisetine, which can be found in horsetail, can result in poisoning when used in high quantities. Don’t allow children to touch the stems. Juice intake has occasionally resulted in adverse effects in children.